Bronze on copper base, green patina. Bronze on purple heart base, green patina. Bronze on circular mahogany wood base. Bronze on rectangular wood base. Bronze floating on vertical wire off dome base. Bronze on green stone 6 in. diameter base. Various woods on 4 in. square wood base. Sterling silver on 4 x 3 in. bronze plate base. 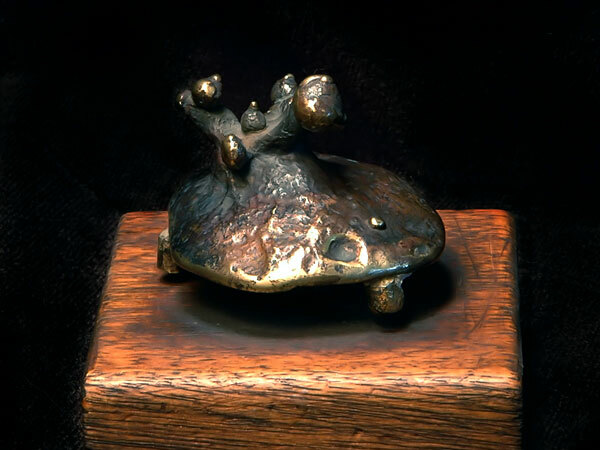 Bronze floating on wire over bronze and wood rectangular base plate. Black leather, wood from tree, black onyx rock, and quartz crystal with copper stone settings. Dimensions: 12 inches long x 2 inches diameter. Comissioned by Cul-de-Sac Camp at Burning Man. The black onyx rock comes from the hot springs around the Black Rock Desert. 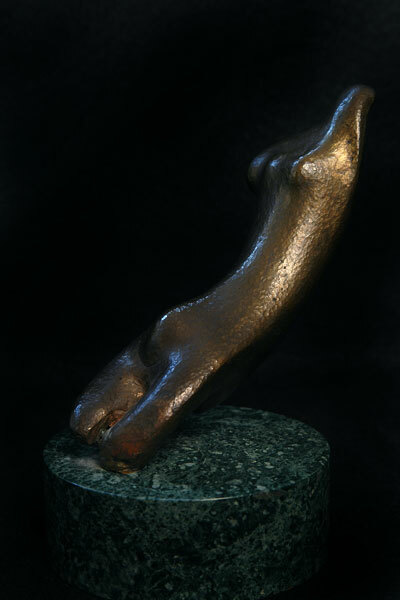 Limited edition of 9 cast into bronze. Brass, steel base, wire and stainless steel ball. Height: 18 inches. 8 inch diameter round wood base. Brass on copper pipe bottom over wood base. Dimensions: 42 inches tall; 8 inch square base. This sculpture was created by Peter in the late 1950s and led to a series of sculptures he created in the 1960s. There were only two others that closely fit with this "geometric" modernist style, but many others followed that also had elements of this geometry worked into them. To this day, much of Peter's and Daniel's jewelry contain and reflect this design aesthetic, making this particular sculpture a very important piece. Ebony wood on brass rounds, with Douglas fir base. Height: 5 inches. Base: 4 x 4 inches. Peter designed this sculpture to demonstrate his vision of how Modernist building design should be "floated" in space. Mild steel, copper, luminesent plastic with rope lighting.